Total hip replacement is a surgical procedure in which the worn out or damaged bone is removed from the hip joint and replaced with artificial components. The hip joint is one of the body's largest weight-bearing joints, located between the thigh bone (femur) and the pelvis (acetabulum). It is a ball and socket joint in which the head of the femur is the ball and the pelvic acetabulum forms the socket. The joint surface is covered by a smooth cartilage which acts as a cushion and facilitates movements of the joint. Repetitive wear and tear, injury, inflammatory disorders, developmental deformities, and other diseases of the joint can damage this protective layer of cartilage, causing pain and difficulty in performing daily activities. Total hip replacement surgery is an option to relieve severe arthritis pain that limits your daily activities. During the procedure, an incision is made over the hip to expose the hip joint and the femur is dislocated from the acetabulum. The femoral head is removed. The surface of the socket is cleaned and the damaged or arthritic bone is removed using a reamer. 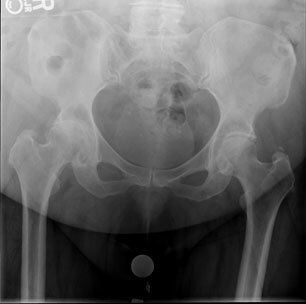 The acetabular component is inserted into the socket and sometimes augmented with screws . A liner made of plastic, ceramic or metal is placed inside the acetabular component. The femur or thigh bone is then prepared by removing the arthritic bone using special instruments, to fit the new metal femoral component. The femoral component is then secured into the femoral canal either by a press fit (cementless) technique or using bone cement. 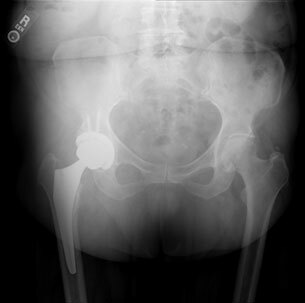 A femoral head component made of metal or ceramic is then secured onto the femoral stem. The muscles and tendons around the new joint are repaired and the incision is closed. Stem: The stem fits into the femur. Ball: The ball replaces the spherical head of the femur. Cup: The cup replaces the worn-out hip socket. Liner: The liner acts as a bearing interface between the cup and the ball. Metal-on-polyethylene articulation involves the use of a metal ball and a polyethylene liner. Ceramic-on-polyethylene articulation involves the use of a ceramic ball and a polyethylene liner. Metal-on-metal articulation involves the use of a metal ball and a metal liner. Ceramic-on-ceramic articulation involves the use of a ceramic ball and a ceramic liner. Cemented Fixation: The femoral and acetabular components are held together with special bone cement. The bone cement is made from a polymer called polymethylmethacrylate. Cemented fixation is an option for patients with weak bones. Cementless Fixation: Cementless implants are coated with a porous material that allows new bone to grow on the surface of the implant. Cementless fixation is an option for patients with good bone quality. Hybrid Fixation: Hybrid fixation uses a combination of cemented and cementless fixation, usually the acetabular socket is inserted without cement and the femoral stem is inserted with cement. Below are before (left) and after (right) X-rays of a sixty-two-year-old woman showing severe arthritis of the right hip (left side on image) that was treated with a total hip replacement using press-fit (cementless) fixation. Two screws were used to augment the fixation of the socket. This patient had a ceramic head on a polyethylene liner.